Toronto, Ontario, April 9, 2019 – VMedia Inc. has filed a submission stating its support for the recently published Order Issuing a Direction to the CRTC on Implementing the Canadian Telecommunications Policy Objectives to Promote Competition, Affordability, Consumer Interests and Innovation (the “New Direction”). However, the VMedia submission also expresses strong opposition to the continued existence of a previous direction, enacted by then-Minister Maxime Bernier (the “Bernier Direction”), which will continue to impede the development of a robust competitive market in internet and mobile services. 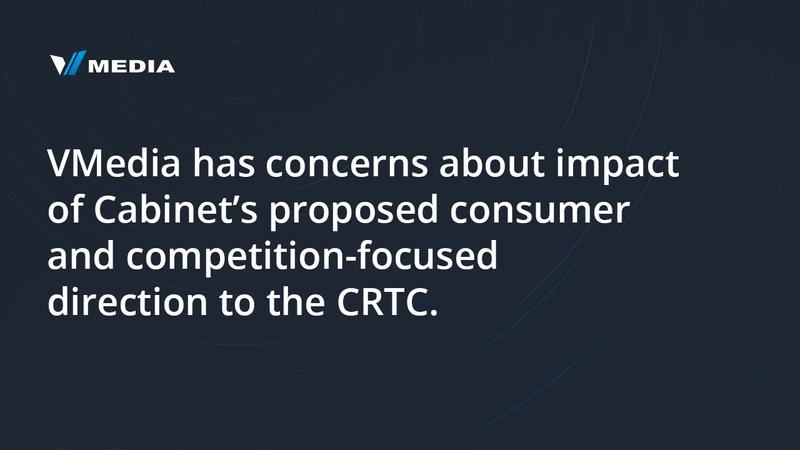 When initially announced in February, the New Direction appeared to be a clear mandate to the CRTC to put consumers and competition first, contrary to the Bernier Direction. However, when the details of the proposed order was gazetted in March, the regulatory analysis that accompanied the draft order stated that the New Direction “will exist in complementary fashion to the previous [Bernier Direction]”. The VMedia submission states that the continued existence of the Bernier Direction will “introduce a new, but equally counterproductive uncertainty to carrying out the important intentions of the New Direction”, and that “the New Direction provides a complete code for the approaches to be taken by the Commission in carrying out its mandate. There is no need for the perpetuation of the Bernier Direction, and it should be scrapped”. The full text of the submission can be found here. VMedia Inc. provides high-speed Internet, TV, Home Phone and Home Security services coast to coast, with lower prices, more choice and flexibility and unique features. VMedia is the only full-service alternative to the major incumbents available across Canada. VMedia is a leader in IPTV technology and the company’s cool, affordable TV platform delivers a whole new home entertainment experience, enabling consumers to seamlessly enjoy conventional TV, over the top content, video on demand, social media and a world of apps. VMedia makes every TV smart!